It is hot in Montreal. Third day in a row my brains (that small amount of substance living in my skull) are melting. I envy those who find this kind of weather "beautiful" and "sunny". My friend called me on Sunday (the day we beat all the records for the heat and humidity) telling me that I have to get out because it's "gorgeous" outside. I might be weird but I don't find sauna-like temperature and humidity "gorgeous", I find it disgusting, suffocating, and too much to handle. OK I am done complaining and can switch to more crochet/knitting related things. By the way, I never complain about cold and you will never hear me saying: "Darn winter, can't wait for it to finish" even if it's snowing in April. This is why I believe I have the right to complain in summer. And yes, at any given moment I would take -30 over +30. First I was not sure what these were and why anyone would knit them, but later on I followed the link to this wonderful website (TitBits). I love when people turn their experience into something creative, I also love when people find more accessible, easier, and cheaper options to solve problems. 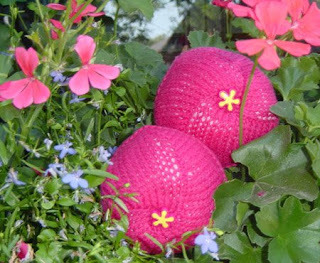 And in case you were too lazy to check out the website, I'll explain you that these are knitted breast prosthesis for breast cancer survivals who had to undergo mastectomy. I think that the idea is BRILLIANT. You can buy the already-made one or you can make one yourself. They are inexpensive (~60$ - compare to silicone ones that are $400) which allows women to have several prosthesis. They could be weighted or not, depending on the "feel" you prefer. They come in natural as well as wild and funky colors. They are SO beautiful. Once again let me tell you that I find this whole thing AWESOME!!!!! P.S. The image comes from Knitty website.